The essential distinction between this second layout, focused on relations, and the first, focused on agents, is that the emphasis is edges rather than nodes, and in particular edge types. In the previous layout edge colour is an extension of node colour: this is a useful way of representing influence between nodes. 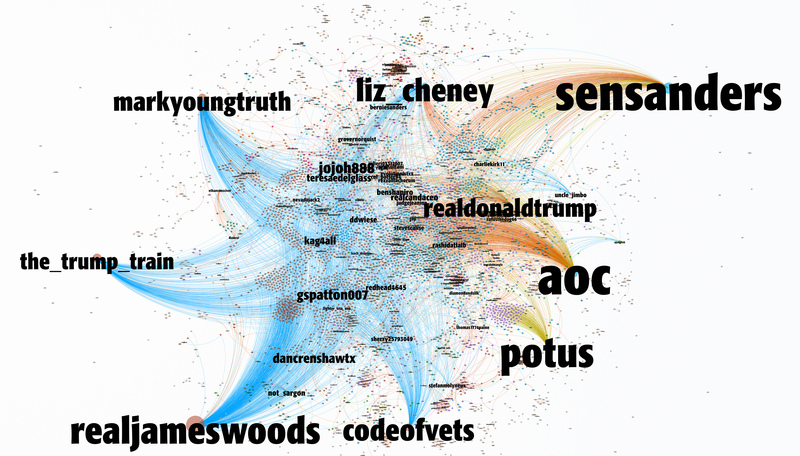 But the graph doesn’t show whether a connection between nodes is the result of a reply, a retweet, and so on. The second layout re-configures the data table by adding a column for edge type, and re-calculating sources and targets in the network for the edges list. Then in the graphing software, edge type can be used as an attribute for determining the colours of edges. The graph shows retweets in blue, replies in red, quotes are purple, mentions in yellow.